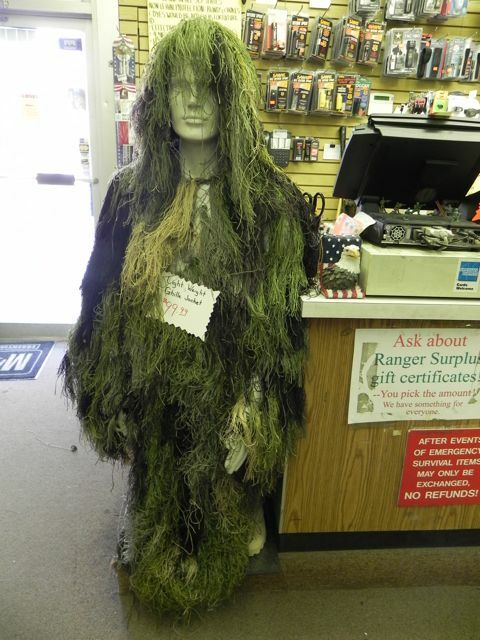 One Halloween I needed a costume in a hurry so I stopped into Ranger Surplus located at 8008 Wisconsin Avenue. 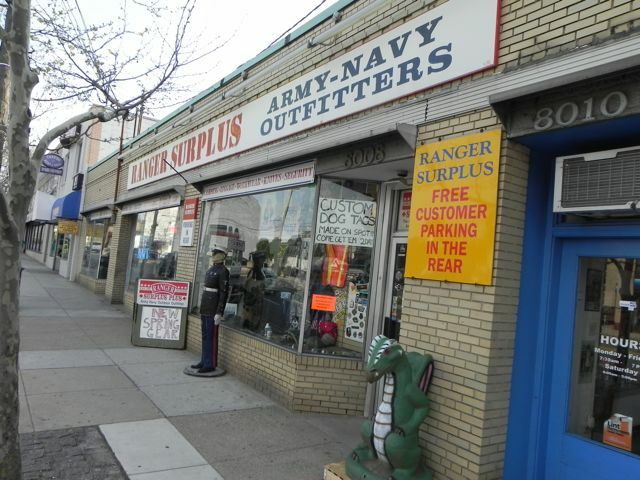 This is one of the last remaining Army-Navy surplus stores in the area. 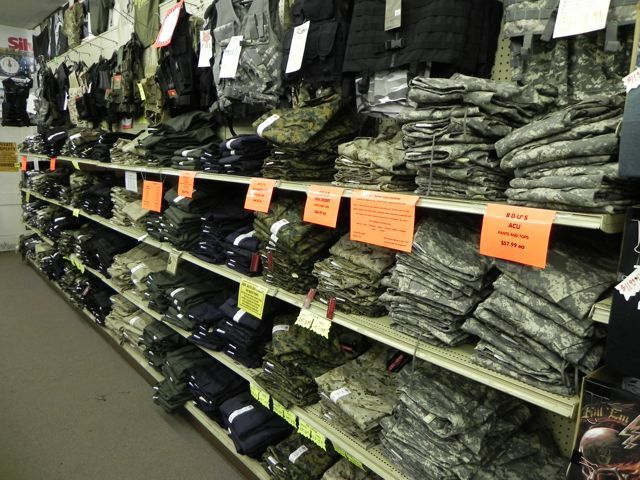 Surplus stores sprang up largely after WWII to buy veterans’ U.S. issued gear and re-sell it to the public. They often had outdoor equipment and supplies. Who better to know about living outdoors than returning WWII vets? I found a great costume here. The store is full of military and police uniforms and gear. I put together some black tactical pants with a black shirt with the word “POLICE” across the front. I also found a black hat with the words “SPECIAL AGENT” embossed. I looked like a member of a SWAT team. The outfit was, and still remains, a hit. I once used the outfit for a musical routine at Pyle Middle School when I was the policeman in a dance rendition of the Village People’s song “YMCA” put on by over-the-hill parents at a Sock Hop. This store is for all the dudes (and gals) out there that never really grew up from playing Army man – that phase you go through as a kid in grade school. When I was a kid my favorite toy was G.I. Joe and I spent hours playing “Army” with my friends. Here are some of the adult “toys” I found will get your testosterone pumping. They have an extensive arsenal of paint ball and Airsoft guns and supplies. What is Airsoft you ask? Airsoft is a sport that uses replica firearms that shoot BB’s instead of say paint. It’s very similar to paintball without the mess. I’ve never played Airsoft but the sport appeals to military and gun enthusiasts. The BBs are larger and have a shorter range which means the velocity of the BB is slower. This is a good thing because a BB flying even at 600 feet per second can definitely chip a tooth or injure an eye. Protective gear, not surprisingly, is a must. And guess which store can provide you some Airsoft equipment? Originally the sport began in Japan where, interestingly, firearms are completely banned. How do these things happen? Ranger Surplus also has quite a collection of knives, pepper spray and nightsticks! 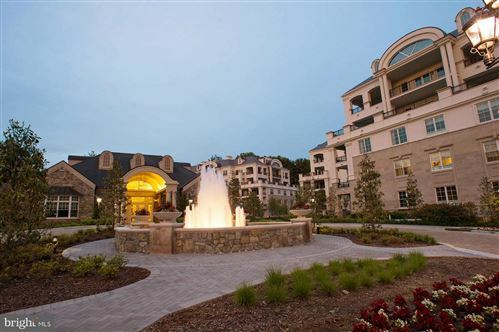 This entry was posted on Friday, April 15th, 2011 at 8:23 pm and is filed under Shops & Businesses. You can follow any responses to this entry through the RSS 2.0 feed. You can leave a response, or trackback from your own site.